Times have changed, but we like to think had the British Royal Navy been given Pinckney Bend Navy Strength Gin, our spirit would still be on board today. Not a Gentle Spirit . 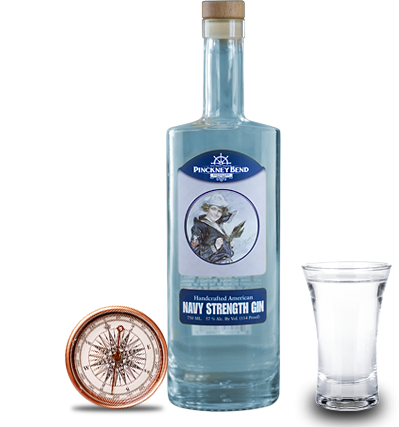 . .
Navy strength gin has a long and varied history with the British Royal Navy. While sailors were given rum rations (“grog”) as part of their wages, gin was strictly for the officers. Fiery & complicated, juniper jumps off the pallet clearly enjoying its life at a higher proof. Assertive rooty, citrus notes blend with other botanicals of lavender, orris root and angelica. Pinckney Bend Navy Strength won silver at the San Francisco International Spirits Competition in 2018. In the 17-1800’s, gin was considered a treatment for all sorts of maladies that wreaked havoc on board naval ships, including scurvy and malaria. Since gin was also supposed to be restricted to the officers, there were predictably suspicious activities that made the spirit-astute Royal Navy suspect their supplies of gin were being diluted. Pursers would test the strength of the alcohol by adding it to gunpowder. Too weak and it would fail to light. If the mixture ignited, then it was ‘proof’ and accepted on board. Ensuring the high strength of the spirit not only protected the navy from being overcharged for watered down gin, it also ensured spirit-soaked gunpowder remained explosive, so should a stormy sea or rough battle cause the many barrels to spill and drench nearby gunpowder, its fire­power would be unaffected. Want to Try Navy Strength Gin? Enjoy this spirit like you would our regular Pinckney Bend American Gin, but expect “more firepower” at 57% ABV/114 proof.